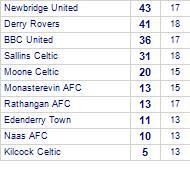 Naas AFC has yet to win in this competition, having lost its last 2 games. 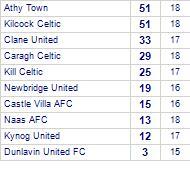 Bush Celtic's last fixture played was a 5-0 loss away against Kildare Town. Kilcock Celtic's last game was a comprehensive 4-0 loss away against Derry Rovers.